Today is a two-post day! I wanted to share a meatless Friday recipe, as promised, for Lent but it’s also recipe swap day. The most recent recipe swap was a little different – rather than getting assigned a certain recipe, we were each given a blog and could pick anything we wanted from it. My assigned blog was Sarah’s A Taste of Home Cooking who hosts these recipe swaps. Sarah’s style is very much homey comfort food – right up our ally! There are so many great recipes on her blog that I had trouble picking – so I delegated the decision to my husband. He picked this pasta dish and I made it on a rainy evening -super warm and satisfying. If you’re interested in more recipes like this or want to see more recipes from this swap, be sure to check out A Taste of Home Cooking. Meanwhile, melt butter and oil in the now-empty skillet you used to cook the chicken. Add garlic and onions and cook until the onions are soft, about 5 minutes. Add the flour and whisk to combine. Add wine and Dijon mustard. Cook about 5 minutes, then reduce heat to low and slowly add milk and chicken stock, stirring to combine. Cook about 5-7 minutes more until mixture begins to thicken. Add cheese, thyme and oregano and stir to melt cheese. 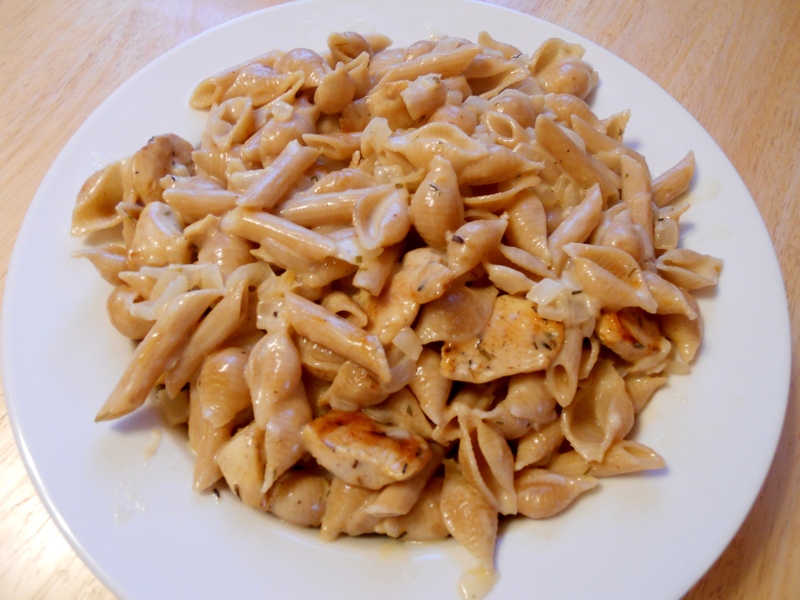 Add chicken and pasta and toss to incorporate sauce. Top with Parmesan cheese and serve. Thanks for the great recipe and hosting the swaps!